Just 3 years into its Women’s fastpitch programme, Softball Ireland is thrilled to announce that Ireland have become the No. 20 ranked team in the world according to the World Baseball Softball Confederation (WBSC) Women’s World Softball Rankings released today. Team Ireland are now the fifth highest ranked European team in the World. Ireland’s World Ranking points are based on 2 years of tournament play compared to the 4 years of most other nations. “We are delighted and honoured to have Ireland ranked No. 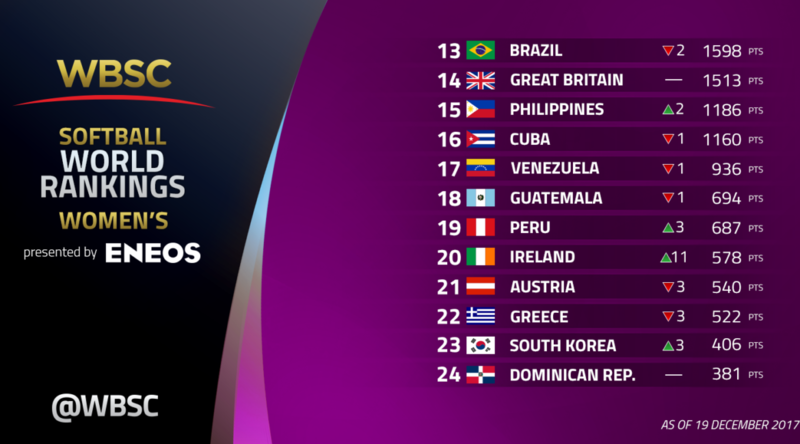 20 in the Women’s World Softball Rankings and to be the fifth highest ranked European team considering we only introduced Fastpitch, the Olympic variation of the game, into Ireland in 2014” said Softball Ireland President, Colum Lavery. Team Ireland, in only its second ever European Championships in 2017, finished a historic high 15th as the team continues its progression up the European rankings. As part of its preparations for the Olympic qualification in 2019, Ireland introduced 9 new caps to the team. Ireland claimed 18th position at the 2017 WBSC Junior Women’s World Championships in Clearwater, Florida. The team was the first junior Irish squad, and achieved historic wins against South Korea, Israel and Peru. The WBSC Softball World Rankings track a country’s entire National Team performance in all WBSC-sanctioned international competitions over a four-year period. This includes the U-19 Junior Women’s and Women’s Softball World Championships, multi-sport games, continental championships, and friendly series. The web-based version and methodology of the WBSC Softball World Rankings can be found at www.wbsc.org/rankings. Softball Ireland is both the representative organisation for players and the administrative authority of the sport in Ireland. It is a member of the World Baseball Softball Federation and the European Softball Federation. Softball Ireland is a “not for profit” organisation and have no paid employees and rely on volunteers from our membership for the management and administration of softball in Ireland. Where necessary, we outsource for the delivery of certain services.